All 2019 General Officer announcements for the Air Force, Marine Corps. and Army. Ranks for General Officer include Brigadier General (one-star), Major General (two-star), Lieutenant General (three-star), General (four-star). Five-Star ranks are typically reserved for use during war-time. Pay grades for General Officers are 0-7 and above. Air Force Brig. Gen. Christopher P. Azzano has been nominated for appointment to the rank of major general. Azzano is currently serving as the commander, Air Force Test Center, Air Force Materiel Command, Edwards Air Force Base, California. Air Force Brig. Gen. Kenneth T. Bibb Jr. has been nominated for appointment to the rank of major general. Bibb is currently serving as the director, Air, Space and Cyberspace Operations, Headquarters Air Force Materiel Command, Wright-Patterson Air Force Base, Ohio. Air Force Brig. Gen. Angela M. Cadwell has been nominated for appointment to the rank of major general. Cadwell is currently serving as the director, Cyberspace Operations, Headquarters North American Aerospace Defense Command and U.S. Northern Command, Peterson Air Force Base, Colorado. Air Force Brig. Gen. Sean M. Farrell has been nominated for appointment to the rank of major general. Farrell is currently serving as the director, Air Force Security Assistance and Cooperation Directorate, Air Force Life Cycle Management Center, Air Force Materiel Command, Wright-Patterson Air Force Base, Ohio. Air Force Brig. Gen. Alexus G. Grynkewich has been nominated for appointment to the rank of major general. Grynkewich is currently serving as the deputy director, Global Operations, J-3, Joint Staff, Pentagon, Washington, District of Columbia. Air Force Brig. Gen. Michael A. Guetlein has been nominated for appointment to the rank of major general. Guetlein is currently serving as the program executive, Programs and Integration, Missile Defense Agency, Redstone Arsenal, Alabama. Air Force Brig. Gen. Timothy D. Haugh has been nominated for appointment to the rank of major general. Haugh is currently serving as the director, Cyber National Mission Force, Headquarters U.S. Cyber Command, Fort George G. Meade, Maryland. Air Force Brig. Gen. Eric T. Hill has been nominated for appointment to the rank of major general. Hill is currently serving as the deputy director, Strategy, Plans and Policy, J-5, Headquarters U.S. Central Command, MacDill Air Force Base, Florida. Air Force Brig. Gen. David R. Iverson has been nominated for appointment to the rank of major general. Iverson is currently serving as the commander, 332d Air Expeditionary Wing, Air Combat Command, Southwest Asia. Air Force Brig. Gen. Lance K. Landrum has been nominated for appointment to the rank of major general. Landrum is currently serving as the deputy director for Requirements and Capability Development, J-8, Joint Staff, Pentagon, Washington, District of Columbia. Air Force Brig. Gen. Jeannie M. Leavitt has been nominated for appointment to the rank of major general. Leavitt is currently serving as the commander, Air Force Recruiting Service, Air Education and Training Command, Joint Base San Antonio-Randolph, Texas. Air Force Brig. Gen. Michael J. Lutton has been nominated for appointment to the rank of major general. Lutton is currently serving as the deputy director, Nuclear, Homeland Defense and Current Operations, J-3, Joint Staff, Pentagon, Washington, District of Columbia. Air Force Brig. Gen. Corey J. Martin has been nominated for appointment to the rank of major general. Martin is currently serving as the U.S. senior defense official/defense attaché, U.S. Embassy, U.S. European Command, Tel Aviv, Israel. Air Force Brig. Gen. Tom D. Miller has been nominated for appointment to the rank of major general. Miller is currently serving as the director, Logistics, Engineering, and Force Protection, Headquarters Air Combat Command, Joint Base Langley-Eustis, Virginia. Air Force Brig. Gen. Richard G. Moore Jr. has been nominated for appointment to the rank of major general. Moore is currently serving as the chief of staff, Headquarters U.S. Air Forces in Europe – Air Forces Africa, Ramstein Air Base, Germany. Air Force Brig. Gen. Aaron M. Prupas has been nominated for appointment to the rank of major general. Prupas is currently serving as the director, Intelligence, Headquarters Air Combat Command, Joint Base Langley-Eustis, Virginia. Air Force Brig. Gen. Bradley C. Saltzman has been nominated for appointment to the rank of major general. Saltzman is currently serving as the special assistant to the Chief of Staff for Multi-Domain Command and Control, Office of the Chief of Staff of the U.S. Air Force, Headquarters U.S. Air Force, Pentagon, Washington, District of Columbia. Air Force Brig. Gen. Michael J. Schmidt has been nominated for appointment to the rank of major general. Schmidt is currently serving as the program executive officer for Command, Control, Communications, Intelligence and Networks, Air Force Life Cycle Management Center, Air Force Materiel Command, Hanscom Air Force Base, Massachusetts. Air Force Brig. Gen. William A. Spangenthal has been nominated for appointment to the rank of major general. Spangenthal is currently serving as the director, Operations and Communications, Headquarters Air Education and Training Command, Joint Base San Antonio-Randolph, Texas. Air Force Brig. Gen. David H. Tabor has been nominated for appointment to the rank of major general. Tabor is currently serving as the assistant commanding general-support, Joint Special Operations Command, U.S. Special Operations Command, Fort Bragg, North Carolina. Air Force Brig. Gen. Andrea D. Tullos has been nominated for appointment to the rank of major general. Tullos is currently serving as the director of security forces, Deputy Chief of Staff for Logistics, Engineering, and Force Protection, Headquarters U.S. Air Force, Arlington, Virginia. Air Force Brig. Gen. John T. Wilcox II has been nominated for appointment to the rank of major general. Wilcox is currently serving as the director, Operations and Communications, Headquarters Air Force Global Strike Command, Barksdale Air Force Base, Louisiana. Air Force Brig. Gen. Craig D. Wills has been nominated for appointment to the rank of major general. Wills is currently serving as the deputy chief, Office of Security Cooperation-Iraq, U.S. Central Command, Baghdad, Iraq. Marine Corps Lt. Gen. David H. Berger for appointment to the rank of general, and assignment as commandant of the Marine Corps. 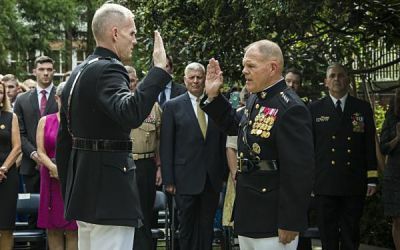 Berger is currently serving as the deputy commandant for combat development and integration; and commanding general, Marine Corps Combat Development Command, Quantico, Virginia. Air Force Gen. John W. Raymond for appointment to the rank of general, and assignment as commander, U.S. Space Command; and commander, Air Force Space Command, Peterson Air Force Base, Colorado. Raymond is currently serving as commander, Air Force Space Command, Peterson Air Force Base, Colorado. Air Force Lt. General Jeffrey L. Harrigian for appointment to the rank of general, and assignment as commander, U.S. Air Forces Europe; commander, U.S. Air Forces Africa; commander, Allied Air Command; and director, Joint Air Power Competence Centre, Ramstein Air Base, Germany. Harrigian is currently serving as deputy commander, U.S. Air Forces Europe; and deputy commander, U.S. Air Forces Africa. U.S. Air Force Gen. Tod D. Wolters for appointment to the grade of general while serving as Supreme Allied Commander, Europe. NATO has also agreed to appoint Gen. Wolters as Supreme Allied Commander, Europe. Gen. Wolters is currently serving as commander, U.S. Air Forces Europe; commander, U.S. Air Forces Africa; commander, Allied Air Command; and director, Joint Air Power Competence Centre. In addition to the NATO position, Gen. Wolters will be assigned as commander, U.S. European Command. Air Force Lt. Gen. James C. Slife for appointment to the rank of lieutenant general, and assignment as commander, Air Force Special Operations Command, Hurlburt Field, Florida. Slife is currently serving as vice commander, U.S. Special Operations Command, Pentagon, Washington, District of Columbia. Air Force Lt. Gen. VeraLinn Jamieson for appointment to the rank of lieutenant general, and assignment as deputy chief of staff, Intelligence, Surveillance, Reconnaissance, and Cyber Effects Operations, Headquarters U.S. Air Force, Pentagon, Washington, District of Columbia. Jamieson is currently serving as deputy chief of staff, Intelligence, Surveillance, and Reconnaissance, Headquarters U.S. Air Force, Pentagon, Washington, District of Columbia. Marine Corps Brig. Gen. Julian D. Alford has been nominated for appointment to the rank of major general. Alford is currently serving as the commander, Task Force Southwest – Afghanistan. Marine Corps Brig. Gen. Michael S. Cederholm has been nominated for appointment to the rank of major general. Cederholm is currently serving as the deputy commander, U.S. Marine Corps Forces Command, Norfolk, Virginia. Marine Corps Brig. Gen. Dennis A. Crall has been nominated for appointment to the rank of major general. Crall is currently serving as the senior military advisor for Cyber to the Under Secretary of Defense – Policy, Washington, District of Columbia. Marine Corps Brig. Gen. Karsten S. Heckl has been nominated for appointment to the rank of major general. Heckl is currently serving as the commanding general, 2d Marine Aircraft Wing, Cherry Point, North Carolina. Marine Corps Brig. Gen. William M. Jurney has been nominated for appointment to the rank of major general. Jurney is currently serving as the commanding general, 3d Marine Division, Okinawa, Japan. Marine Corps Brig. Gen. Tracy W. King has been nominated for appointment to the rank of major general. King is currently serving as the director, J-5, Politico – Military Affairs (Asia), Joint Staff, Washington, District of Columbia. Marine Corps Brig. Gen. Christopher J. Mahoney has been nominated for appointment to the rank of major general. Mahoney is currently serving as the deputy commander, U.S. Forces Japan, Yokota, Japan. Marine Corps Brig. Gen. Gregory L. Masiello has been nominated for appointment to the rank of major general. Masiello is currently serving as the program executive officer, Air Anti – Submarine Warfare, Assault, and Special Mission, Naval Air Systems Command, Patuxent River, Maryland. Marine Corps Brig. Gen. Stephen M. Neary has been nominated for appointment to the rank of major general. Neary is currently serving as the deputy commanding general, II Marine Expeditionary Force; and commanding general, 2d Marine Expeditionary Brigade, Camp Lejeune, North Carolina. Marine Corps Brig. Gen. Austin E. Renforth has been nominated for appointment to the rank of major general. Renforth is currently serving as the director, Joint Operations Center – Baghdad, Iraq. Marine Corps Brig. Gen. Paul J. Rock Jr. has been nominated for appointment to the rank of major general. Rock is currently serving as the commanding general, Marine Corps Installations – Pacific, Okinawa, Japan. Marine Corps Brig. Gen. Joseph F. Shrader has been nominated for appointment to the rank of major general. Shrader is currently serving as the commanding general, U.S. Marine Corps Logistics Command, Albany, Georgia. Marine Corps Brig. Gen. Stephen D. Sklenka has been nominated for appointment to the rank of major general. Sklenka is currently serving as the commanding general, 1st Marine Logistics Group, Camp Pendleton, California. Marine Corps Col. Marcus B. Annibale has been nominated for appointment to the rank of brigadier general. Annibale is currently serving as the head, Aviation Weapons and Programs F-35 Branch, Department of Aviation, Headquarters, U.S. Marine Corps, Washington, District of Columbia. Marine Corps Col. Robert C. Fulford has been nominated for appointment to the rank of brigadier general. Fulford is currently serving as director, Expeditionary Warfare School, Marine Corps University, Marine Corps Base Quantico, Virginia. Marine Corps Col. Daniel Q. Greenwood has been nominated for appointment to the rank of brigadier general. Greenwood is currently serving as deputy assistant to the President of the United States, Deputy Director for the White House Office of Legislative Affairs, Washington, District of Columbia. Marine Corps Col. Joseph A. Matos III has been nominated for appointment to the rank of brigadier general. Matos is currently serving as the assistant chief of staff, Information Environment division, U.S. Marine Corps Forces Pacific, Camp Smith, Hawaii. Marine Corps Col. Jason L. Morris has been nominated for appointment to the rank of brigadier general. Morris is currently serving as the assistant chief of staff, G-3, I Marine Expeditionary Force, Camp Pendleton, California. Marine Corps Col. David Nathanson has been nominated for appointment to the rank of brigadier general. Nathanson is currently serving as the assistant chief of staff, G-4, I Marine Expeditionary Force, Camp Pendleton, California. Marine Corps Col. Thomas B. Savage has been nominated for appointment to the rank of brigadier general. Savage is currently serving as the executive assistant to the deputy commandant for Plans, Policies, and Operations Directorate, Headquarters, U.S. Marine Corps, Washington, District of Columbia. Marine Corps Col. Daniel L. Shipley has been nominated for appointment to the rank of brigadier general. Shipley is currently serving as the deputy director, Program Analysis and Evaluation, Department of Programs and Resources, Headquarters, U.S. Marine Corps, Washington, District of Columbia. Marine Corps Col. James B. Wellons has been nominated for appointment to the rank of brigadier general. Wellons is currently serving as the head, Weapons Requirements Branch, Department of Aviation, Headquarters, U.S. Marine Corps, Washington, District of Columbia. Marine Corps Col. Brian N. Wolford has been nominated for appointment to the rank of brigadier general. Wolford is currently serving as the chief of staff, II Marine Expeditionary Force, Camp Lejeune, North Carolina. Marine Corps Reserve Col. Leonard F. Anderson IV has been nominated for appointment to the rank of brigadier general. Anderson is currently serving as the assistant wing commander, 4th Marine Aircraft Wing, U.S. Marine Corps Forces Reserve, New Orleans, Louisiana. Marine Corps Reserve Col. William E. Souza III has been nominated for appointment to the rank of brigadier general. Souza is currently serving as the deputy commander, Headquarters and Service Company, 23d Marine Regiment, 4th Marine Division, San Bruno, California.